When you start planning your wedding, you’re looking everywhere for tips and ideas to make your big day spectacular. Planning the ceremony is the easy part, but planning a creative wedding reception your friends and family will never forget is the hard part. What makes a wedding reception creative? In fact, there are many ways to make your wedding reception creative and fun. 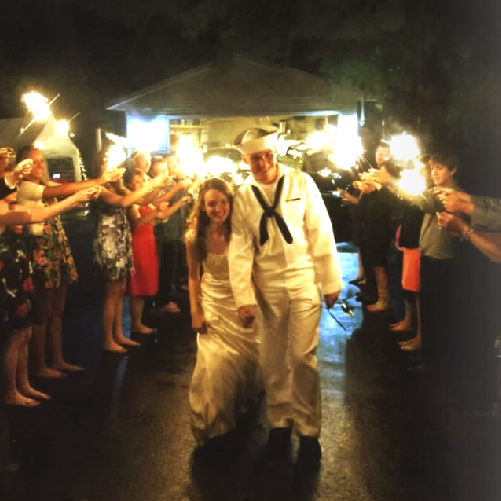 Sparklers for your wedding reception are a creative touch that will get your guests involved and make for great photos! How do you know which ones to purchase? 36 inch sparklers are smoke-free and last an average of 3.5 minutes! Have sparklers for all of your attendees to wave as you depart from your reception. Imagine running through a tunnel lit by sparklers and your loves ones. Share the story of your love with your attendees! Place pictures and memories that led you to the big “I do” around your reception. It’s YOUR day, tell YOUR story. Print off your photos as polaroids and string them throughout the reception with lights and other decor. Include fun games and activities for your guests to participate in during your reception. These games can be bride and groom trivia, ice breaker games for the tables or scavenger hunts. Have a “make your own station”! Be creative! Make your own bloody marys, desserts, tapas dishes, etc. are great stations for guests to get involved and make their own signature creations! Hire a local food truck to serve handheld foods such as tacos, ice cream or pizza! Food trucks are a popular trend right now, why not have one at your wedding? The food will not disappoint! The majority of your guests are active on social media. Give them a reason to post live pictures from your wedding and show their followers how much fun they’re having! Include stations with fun props for photos and your wedding #hashtag. Props can be hats, glasses, shapes, phrases, etc. Pictures last forever, make them good! Instead of using a DJ, try something different! Hire a local band to perform at your wedding. It won’t be songs that are on the radio and that will make it unique! It will get your guests on their feet, dancing the night away. Hiring a band to perform will keep your reception interesting and unique. They can even perform songs by request with their own twist on the song!